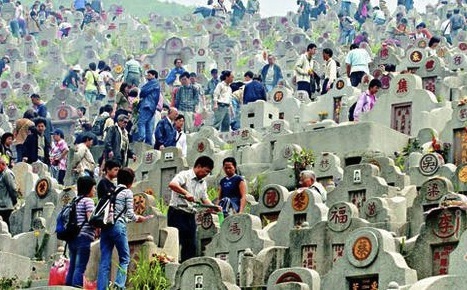 The first day of Qing Ming is now a national Holiday, but often schools, and even companies, would organize trips to the cemetery to clean the tombs and graves of war heroes, martyrs, notables and ancestors. 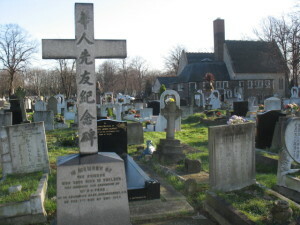 The importance of ancestors, has also led to the importance of graves in Chinese culture, with ornate mausoleums and tombs to famous bloodlines being very much the order of the day.However, over the last couple of decades, burial traditions have changed immensely. 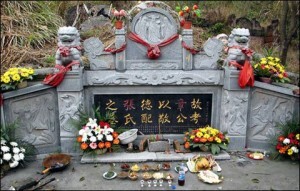 As land has slowly become an increasingly limited resource, and the population strains the environment, the Chinese state has had to be innovative in creating alternative burial rites for the recently deceased, and encourage its people to adopt them. When they began this campaign, in the 1990s, alternatives such as cremations and sea burials were offered, but many were unwilling to let go of the remains of their dead loved ones. Only in the last ten years has there been a gradual change of attitudes, often eased along by governmental programmes covering free travel for grieving families, or complimentary urns, thus freeing up large tracts of land for desperately needed housing. My Cantonese grandfather died at a young age, and as a child, I went with the family to sweep his traditional curved stone grave, the type that always reminds me of an immense, comfortable armchair. My maternal grandfather, a veteran of China’s revolution, who passed away during the first decade of the 21st century, was cremated. His ashes are kept at a collective mausoleum at a cemetery in north China. It feels peaceful and pleasant in there, with the sun shining through the central glass dome. On either side of the paths that branch off from the central rotunda, are neat rows of glass fronted lockers, housing a box of the departed’s ashes, along with grave goods left by families and friends who can visit to pay their respect. My grandfather’s ashes nestle between his set of Baoding balls and paper fan that he always carried with him, a miniature plastic television, and a packet of his favourite brand of cigarettes, to help him relax. 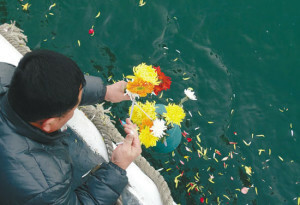 It’s interesting that cremation is a subject that fascinates Chinese writers and artists. It has been explored in works such as Majian’s short story collection “The Noodle Maker” (2004) and Peng Tao’s film “The Cremator” (2012). Other methods popular in China are tree burials and sea burials, the latter being one that the government have very actively encouraged, with a subsidy of RMB 4000 to cover transport and travel, insurance, a biodegradable coffin, and of course, a meal for the family. If you are very well off, and wanted to give your loved one a spectacular send-off, you could opt for their ashes to be launched into space. Prices range from around RMB6000 from a Beijing undertaker, to RMB75,000 by Biian (literally “the far shore” or “the other side”), a company authorized to make the journey into space by Celestis Inc. So far, apparently nobody has made use of the service, which surprises me, considering the traditional Chinese vision of becoming immortal is to ascend towards the heavens to live amongst the celestials. Qing Ming remains largely, a festival celebrated within China and by the Chinese diaspora in other parts of Asia. 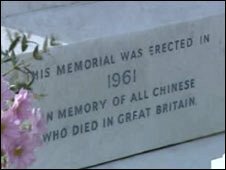 Although I am sure local Chinese families all over Britain will be honouring the graves of their deceased relatives around this time. So if you’re passing a cemetery in the coming week you may spot freshly scrubbed and gifted-to Chinese graves. Let us also remember the forgotten Chinese soldiers who fought for Britain during the First World War, such as the Chinese Labour Corps. There are some memorials commemorating these Chinese people in cemeteries around Britain, such as the East London Cemetery, and the Pantmawr Cemetery in Cardiff, that could do with sweeping, and some fresh chrysanthemums and oranges.